Rauma is a town and municipality of ca. 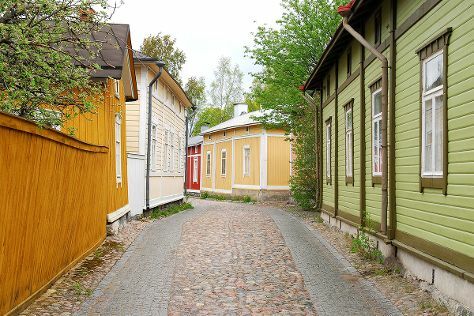 Deepen your sense of the past at sights like Old Rauma and Amuri Museum of Workers' Housing. Get some cultural insight at Tampere Art Museum and Laukko Manor. Explore Rauma's surroundings by going to Ideapark (in Lempaala), Pori (Pori Art Museum, Kauppakeskus Puuvilla, & more) and St Olaf's Church in Tyrvaa (in Sastamala). There's lots more to do: pause for some serene contemplation at The Church of the Holy Cross, get engrossed in the history at The Old Town Hall Museum, see the interesting displays at Marela Museum House, and look for all kinds of wild species at Hatanpaa Arboretum. Find out how to plan Rauma trip without stress by asking Inspirock to help create an itinerary. If you are flying in from Croatia, the closest major airports are Helsinki Vantaa Airport, Turku Airport and Tampere-Pirkkala Airport. Expect a daytime high around 22°C in August, and nighttime lows around 12°C. Wrap up your sightseeing on the 7th (Wed) early enough to travel back home.